Martin, M.O. & Mullis, I.V.S. (Eds.). (2013). Chestnut Hill, MA: TIMSS & PIRLS International Study Center, Boston College. In 2011, the coincidence of the TIMSS and PIRLS assessments offered a unique opportunity for participating countries to assess the same fourth grade students in mathematics, science, and reading. This report profiles fourth grade student achievement in these three subjects from the 34 countries and 3 benchmarking entities that administered both TIMSS and PIRLS in 2011. Additional analyses focus on student achievement with respect to the reading demands of the TIMSS fourth grade mathematics and science items, characteristics of effective schools, and specific home background characteristics that are associated with higher student achievement in reading, mathematics, and science at the fourth grade. Publications are available in Portable Document Format (PDF). You may need to download a copy of Adobe Reader, to enable you to read and print the report. 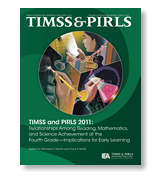 The TIMSS and PIRLS 2011: Relationships Among Reading, Mathematics, and Science Achievement at the Fourth Grade—Implications For Early Learning also is available in a printed and bound volume, which can be ordered for a fee of US$50.00. Shipping and handling costs for orders within the U.S. are $5.00. Shipping and handling costs for international orders are US$15.00. Print a faxable order form. Foy, P. (2013). Chestnut Hill, MA: TIMSS & PIRLS International Study Center, Boston College. The TIMSS and PIRLS 2011 Fourth Grade Combined International Database provides access to fourth grade student data collected and analyzed as part of both TIMSS and PIRLS 2011. The aim is to support and promote the use of these data by researchers, analysts, and others interested in improving education. The database is available for download on this page. The database includes student achievement data as well as the student, parent, teacher, school, and curricular background data for the 34 countries and 3 benchmarking entities that administered both the TIMSS and PIRLS 2011 assessments to the same samples of fourth grade students. The student, parent, teacher, and school data files are in SAS and SPSS formats with programs. The entire database and its supporting documents are described in the TIMSS and PIRLS 2011 User Guide for the Fourth Grade Combined International Database (Foy, 2013). The data can be analyzed using the downloadable IEA IDB Analyzer, an application developed by the IEA Data Processing and Research Center to facilitate the analysis of the TIMSS and PIRLS data. Some contents of the TIMSS and PIRLS 2011 Fourth Grade Combined International Database are available in Portable Document Format (PDF). If needed, click here to download Adobe Reader® to read and print these materials. SOURCE: SOURCE: TIMSS 2011 Assessment and/or PIRLS 2011 Assessment. Copyright © 2013 International Association for the Evaluation of Educational Achievement (IEA). Publisher: TIMSS & PIRLS International Study Center, Lynch School of Education, Boston College. These supplemental materials contain technical information underlying the analyses presented in Chapter 2 and Chapter 3 of the TIMSS and PIRLS 2011 Relationships Report.